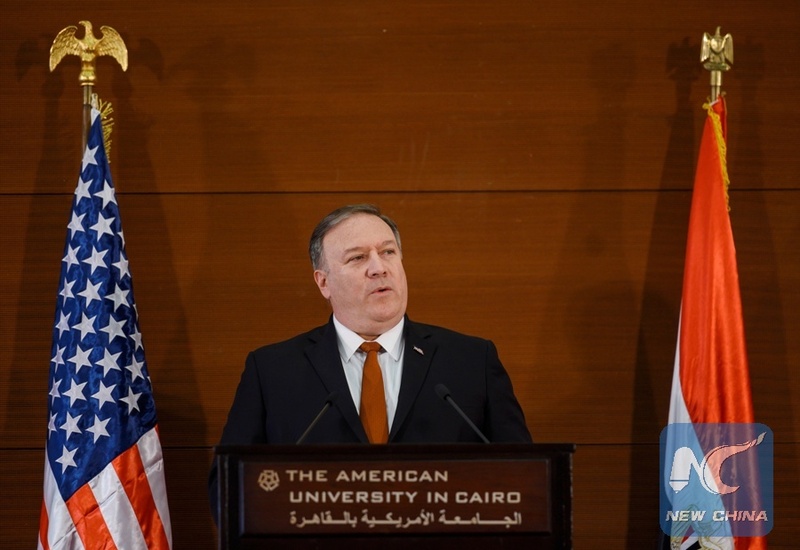 WASHINGTON, Jan. 10 (Xinhua) -- U.S. Secretary of State Mike Pompeo's speech in Egypt on Thursday on U.S. policy in the Middle East was self-congratulatory and unconvincing, experts said. Pompeo arrived in Egypt late Wednesday following stops in Jordan and Iraq, on a tour for the Middle East that also includes Bahrain, Qatar, United Arab Emirates (UAE), Saudi Arabia, Kuwait, and Oman. The speech, which took place at the American University in Cairo, was widely regarded as an explicit repudiation of the address that former U.S. President Barack Obama made in Cairo in 2009. Robert Malley, president of International Crisis Group and White House coordinator for the Middle East in the Obama administration, said that the speech was "a self-congratulatory and delusional depiction" of the Middle East policy of the administration of U.S. President Donald Trump. Pompeo indicated that it was the "fundamental misunderstandings and misjudgments" of Obama that adversely affected the lives of hundreds of millions of people across the region. Pompeo also attributed the destruction of the Islamic State (IS) to the Trump administration, noting that Trump's predecessor "underestimated the tenacity and viciousness of radical Islamism." However, the U.S.-led campaign against the IS began in 2014, and the bulk of IS fighters were eliminated during the pre-Trump period, according to some senior U.S. military officials. Robin Simcox, a fellow at the Heritage Foundation, said that the Trump administration did make some effective tactical changes in counter-terrorism, but it has not strayed far from the policy of previous presidents in a broader strategic picture. Pompeo said on Thursday that the United States would "use diplomacy" and work with partners to expel the Iranian presence from Syria. The reality is that among nine countries that are included in Pompeo's trip, five of them, namely Egypt, Jordan, UAE, Qatar, and Saudi Arabia, don't have a U.S. ambassador, according to American Foreign Service Association. Empty ambassador posts that are filled in an interim capacity by career diplomats, who don't have the same clout or influence in their host country, might hamper U.S. engagement in the region, Robbie Gramer argued in a Foreign Policy article. The contradictory messages in Pompeo's speech, such as to "expel every last Iranian boot in Syria" and "bring our troops home from Syria," also further reflect the lingering twists and turns of Trump's Syria pullout decision. Richard Haass, president of the Council on Foreign Relations, commented on Twitter that Pompeo's remarks of "when America retreats, chaos follows" served as a good critique of the Trump administration's Middle East policy. Pompeo seems to be distancing himself from the White House, or at least trying to delay the presidential order for immediate withdrawal from Syria, Dan Mahaffe, senior vice president and director of policy at the Center for the Study of the Presidency and Congress, told Xinhua. Pompeo's speech also underscored that future U.S. Middle East strategy would overwhelmingly focus on countering Iran. By calling Iran "a common enemy," Pompeo sought to convince regional allies that the establishment of the Middle East Strategic Alliance (MESA), also known as the Arab NATO, which includes the Gulf Cooperation Council (GCC), as well as Egypt and Jordan, would serve their interests to counter Iran's action in the region. "The idea of an Arab NATO is wholly unconvincing," said Yezid Sayegh, a senior fellow at the Carnegie Endowment for International Peace, adding that the GCC has failed multiple times to agree on joint defense capability. Giorgio Cafiero, CEO and founder of Gulf State Analytics, a geopolitical risk consultancy based in Washington, argued that the divergent strategic priorities of Arab countries, as well as their fundamentally different attitudes toward Iran would be major political obstacles to the MESA.